A ways back I posted about the new Hannaford Brothers Guiding Stars program that was hitting Canadian Loblaws. While I think there are more powerful front-of-package scoring programs out there, I figured that the simple fact that the Guiding Stars program scores everything in the store puts it head and shoulders above Health Check in terms of shopping utility. I also guessed that there'll be examples where the Guiding Stars program and Health Check disagree. Take the photo up above. Regular Cheerios - 2 stars and a Health Check. 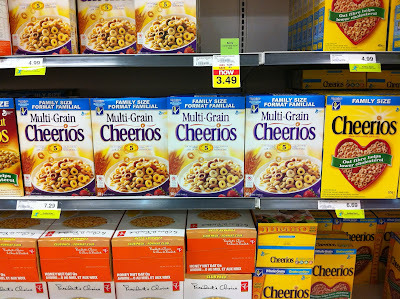 Multigrain Cheerios - 1 stars and an identical Health Check. Why did Multigrain Cheerios score lower on the Stars? Probably in part due to the extra nearly 1.5 teaspoons of added sugar per bowl. Way to misinform shoppers Health Check. Great job.